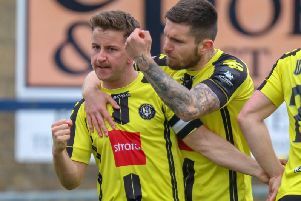 Dominic Knowles stole a last-gasp win for Harrogate Town as Simon Weaver’s men downed Hednesford Town 2-1 at the CNG Stadium on Saturday. Knowles pounced in the final minute of injury-time with a cool finish to give Town their second win in three matches. Brendan Daniels continued his fine start to life at the CNG Stadium with a 30-yard strike to open the scoring before half time. Hednesford pushed hard for an equaliser and it came courtesy of Andy Todd’s volley. But with the points looking destined to be shared, Knowles rounded visiting goalkeeper Dave Parton and slotted the ball home deep into injury-time. Visiting keeper, Parton, was first into action when he dived full length to cut out a dangerous Joe Colbeck cross,while seconds later, Hednesford’s, Ahmed Obeng fired high into the side netting. Obeng almost fashioned an opener for the Pitmen when Peter Crook chased out of his goal, but luckily for Town, Kyle Perry miscued Obeng’s centre well wide. Two strong headers from the excellent Danny Ellis cleared Harrogate’s lines as the visitors pressed, but Paul Thirlwell almost gave Town the lead with a rising drive, that Parton touched just over the bar. Harrogate finished the half the stronger and a foul on Knowles on the edge of the area saw Parton keep out Brendan Daniels’s free kick,but moments later, Daniels picked up the ball in midfield and beat Parton from fully thirty yards, to give Harrogate the interval lead. The second half began with Sean Williams shooting well wide for the visitors and for Harrogate, a clever dink through the defence by Lewis Turner enabled Colbeck to win a corner, which was headed away by the uncompromising Pitmen’s defence. Hednesford were pushing hard for an equaliser and it duly came after sixtyone minutes, when Paul Ennis cut the ball back from the byline and Andy Todd lashed in an unstoppable volley. The introduction of Jordan Thewlis,Jack Emmett and Louis Swain gave Harrogate a new lease of life and it took a last ditch tackle to prevent,Cecil Nyoni from restoring Town’s lead. Emmett was tormenting the Pitmen’s defence, but Paul Clayton and Knowles were finding it hard to create shooting chances. As the game entered the final two minutes, Hednesford were awarded a free kick on the edge of Town’s area,but Crook pulled out a superb save to keep out Sean Williams’s curling shot round the wall. With time fast running out, Thewlis made a strong run into the heart of the Pitmen’s defence and his shot ricocheted to Knowles,who calmly rounded the keeper and picked his spot to give Town a last gasp victory and send them up to sixth in the table. Nyoni, Clayton (Swain 79),Knowles, Daniels (Emmett 70).